Close to area we were visiting. The hotel had kind of a retro vibe...which we liked. Nice room, clean, staff very nice and helpful. Would stay here again. It was a very nice hotel. We loved everything about it, except the location. If you need to be close to downtown this is NOT the hotel for you if you need to be close to Forest Park or Washington U, this is a fabulous choice. The area did have some very nice restaurants nearby. It's an up and coming neighborhood, but just not there yet. Very nice and clean hotel. Best bed I've slept on in a long time, rooftop bar was a perfect way to end our day. Super cool hotel in a super cool area of town. We were even offered rum punch upon checking in! We will definitely be back! This is a wonderful hotel with very friendly and helpful staff. This is our 3rd visit this year as we live relatively close (Wisconsin)... We love this hotel so much mostly because along with the cleanliness, the great staff and restaurant, there is rooftop bar/lounge! This lounge offers amazing views of St. Louis! We will be back again! Room had comfortable beds and was clean. Accommodating staff. Walking distance to WashU. Easy to check in. Very fashion forward inside. Good technology for the elevator and door locks. Good interior bedrooms. Free parking in the back. The hotel was great we made new friends the staff was great and we got to meet the drummer from Korn! Boutique hotel with a quirky space age theme on the Delmar loop. Lots of restaurants and bars nearby, a pleasant 25 minute walk away from the St Louis Art museum. Definitely a hotel with personality - a lot of fun to stay there. I strongly recommend this hotel.. will definitely stay there again. Unique art-deco rooms and sociable rooftop bar-lounge. Comfortable clean beds and rooms. Good location for us (close to museums, visiting friends, etc) with free parking available in back. Easy walk up and down the block to good late-night restaurants, bars, and entertainment (Close to Washington University) in middle of Delmar Loop. Staff very friendly, and the hotel owner is a very avid Apollo space collector. Would come back again. This has become my regular place to stay on St. Louis trips. The staff are unfailingly friendly and professional, the service excellent, the facilities cool and comfortable. It would be so easy to make the moon/space theme cheesy, but here it fits perfectly with the mid-20th century modern furniture. The Moonrise Hotel is in one of the most lively neighborhoods in town, with plenty of restaurants and shops to walk to. For entertainment, there is The Pageant next door, and the Tivoli Theater down the street. Stay here--you'll have a great time. Went to see a great show and was even better with great accommodations and friendly professional staff. My husband and I enjoyed this fun retro hotel - they committed to the retro theme and space/moon theme in a fantastic way. The rooftop bar was really fun - we enjoyed a couple of cocktails "under the moon." Staff was very friendly and exceptionally helpful. Rooms were clean and comfortable. Forest Park is a short stroll from Moonrise Hotel, and other popular attractions like Washington University are within a mile (2 km). This 125-room, 4-star hotel has a restaurant, a 24-hour fitness center, and free in-room WiFi. This hotel serves as home to a rooftop bar, along with a restaurant that specializes in American cuisine. Savor a meal from the comfort of your room with room service, or get a quick energy boost at the coffee shop/café. For your convenience, a cooked-to-order breakfast is served for a fee each morning from 6:30 AM to 11 AM. Guests can expect to find free WiFi and 50-inch a plasma TV with cable channels. Pillowtop beds sport premium bedding and the bathroom offers a rainfall showerhead, a hair dryer, and designer toiletries. Other standard amenities include an iPod dock, a refrigerator, and a coffee maker. 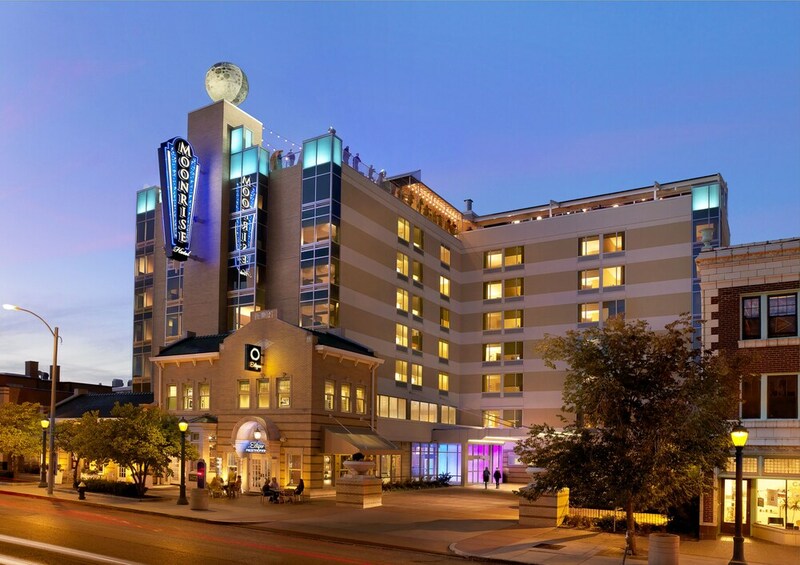 Guests staying at Moonrise Hotel enjoy a 24-hour fitness center, a rooftop terrace, and free WiFi in public areas. Valet parking is available for USD 17 per day. The front desk is staffed 24/7 to help with luggage storage, dry cleaning/laundry, and tours or tickets. Other amenities at this adults-only hotel include a 24-hour business center, coffee/tea in a common area, and a computer station. Cooked-to-order breakfast is served daily from 6:30 AM to 11 AM for a fee. Eclipse Restaurant - Restaurant and bar specializing in American cuisine and serving breakfast, lunch, and dinner. Rooftop Terrace Bar - Rooftop bar specializing in American cuisine. Recreation features at Moonrise Hotel include a 24-hour fitness center. The preferred airport is St. Louis, MO (STL-Lambert-St. Louis Intl. ).